Mindfulness is a "hot topic" in Western psychology right now - increasingly recognised as a powerful therapeutic intervention for everything from work stress to depression - and also as an effective tool for increasing emotional intelligence. 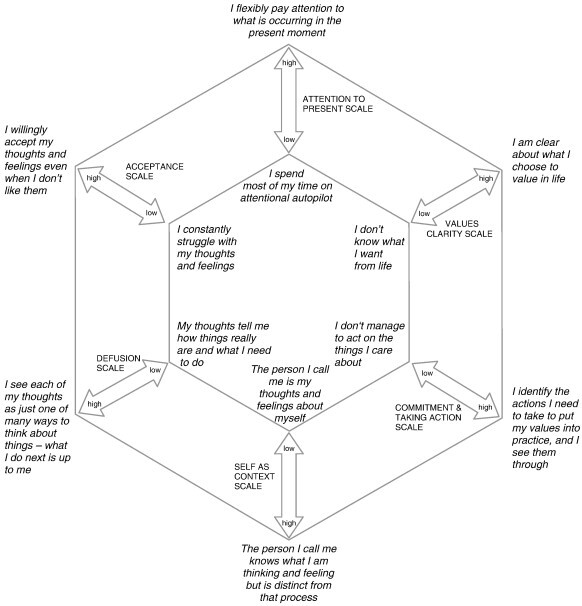 Acceptance and Commitment Therapy is a powerful mindfulness-based therapy (and coaching model) which currently leads the field in terms of research, application and results. Mindfulness is a mental state of awareness, focus and openness - which allows you to engage fully in what you are doing at any moment. In a state of mindfulness, difficult thoughts and feelings have much less impact and influence over you - so it is hugely useful for everything from full-blown psychiatric illness to enhancing athletic or business performance. In many models of coaching and therapy, mindfulness is taught primarily via meditation. However, in ACT, meditation is seen as only one way amongst hundreds of learning these skills - and this is a good thing, because most people do not like meditating! ACT gives you a vast range of tools to learn mindfulness skills - many of which require only a few minutes to master. These 3 skills require you to use an aspect of yourself for which no word exists in common everyday language. It is the part of you that is capable of awareness and attention. In ACT, we often call it the 'observing self'. We can talk about 'self' in many ways, but in common everyday language we talk mainly about the 'physical self' - your body - and the 'thinking self' - your mind. The 'observing self' is the part of you that is able to observe both your physical self and your thinking self. A better term, in my opinion, is 'pure awareness' - because that's all it is: just awareness, nothing else. It is the part of you that is aware of everything else: aware of every thought, every feeling, everything you see, hear, touch, taste, smell, and do.